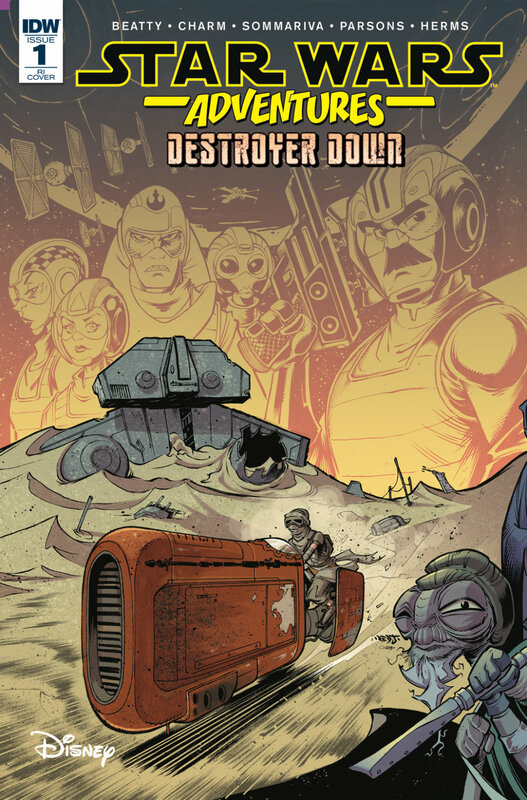 The premier issue of Destroyer Down provides the first chapters of an interlocking storyline. 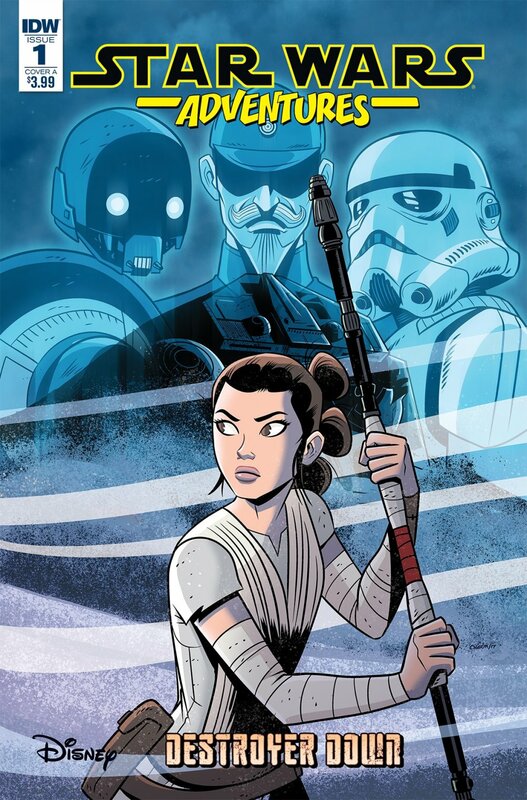 The first story follows Rey in her scavenger days prior to the events of The Force Awakens (TFA). The whirling sands of Jakku have revealed the derelict Star Destroyer Spectral which is thought to behold a trove of valuable salvage. Unkar Plutt tasks the inhabitants of Niima Outpost to claim the wreck on his behalf. Plutt attempts to strangle any voice of discontent but is interrupted by the guarding hand of Constable Zuvio. Zuvio grows beyond his four-frame screen appearance in TFA to a role with dialogue and the impression of recurrence for later in the series. Rey balks at Plutt’s demands and sets off to be the first to explore and lay claim to whatever lies within. 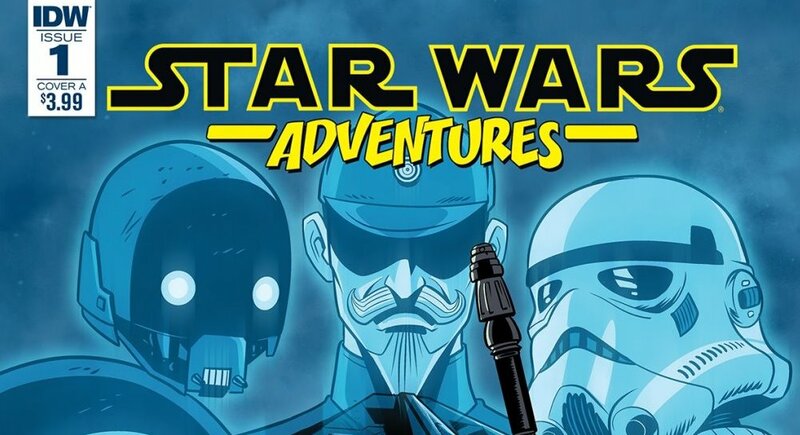 The second begins the background story which occurs following the events of Return of the Jedi (ROTJ). We are introduced to the Star Destroyer Spectral and begin to learn about what exactly is so unique about the ship and the legends that surround it. We meet the overconfident commander and loyal crew that allegedly went down with the ship just as they embark on their fateful voyage to Jakku. Additionally, we are introduced to Shephard Squadron, a Rebel squadron consisting of a mix of A-Wings, Y-Wings, and X-Wings that are embattled with the Spectral before it’s escape. Glancing over the issue, a reader may not notice the difference in the artwork. However, the difference is in the details. Jon Sommariva’s subtle detailing in his penciling complement Derek Charm’s style in the preceding chapter. An interesting approach, which enables the distinction between the timelines of the stories. The creative teams for both stories have created a flash-like pace as the action jumps frame-by-frame. The effect gets the stories across similar to the animation of the early Forces of Destiny pieces. Scott Beatty has created an interesting story by paralleling separate timelines centered from one location. There is a wealth of storytelling in Rey’s adventures before TFA and certainly an even amount in the period following ROTJ. Balancing the two together is a clever design. Unexpectedly, I met Mr. Beatty in person the morning after reading this issue. He graciously signed a copy for me and certainly was the highlight of the day.